Here’s one for you. The invention of raisin bread is credited to Henry David Thoreau, an American author, poet and naturalist (and much more). His book “Walden” chronicles his life of simple living in natural surroundings in the first half of the 1800s. If he's not an early proponent of “back to the land” I don't know who is. end of the pan? Read on to find out why. Regardless of its birth, raisin bread is now ubiquitous across all of North America. Most people love it, except those who have an aversion to raisins. My spouse is in that group. So I have all of this bread to eat myself. Good thing it’s delicious toasted. I want to digress for a minute to talk about a hole – in particular the hole in the end of the bread pan in the picture above left. She also volunteered the reason for the hole. I thought it might be for hanging them or similar, but I was wrong. Mom and dad were married in the early 1950s. At that time she was teaching at the local elementary school. Every Christmas the school would put on an old-fashioned Christmas Concert. make a slightly sticky dough. At that time the concerts would have been held in the old IOOF hall close to the corner of the village. The hall has long since disappeared. Anyone of a certain vintage from where I grew up knows exactly where I mean. That year they needed “stage lights,” so dad drilled holes in the end of each bread pan, threaded a light through the holes and used the pans as reflectors. Using the pans meant the light would go up onto the stage as opposed to back into the eyes of the audience. They must have needed more than two stage lights. I wonder who else’s bread pans were conscripted into service that Christmas! It’s amazing the memories that are held in the most simple things – even two well used bread pans. 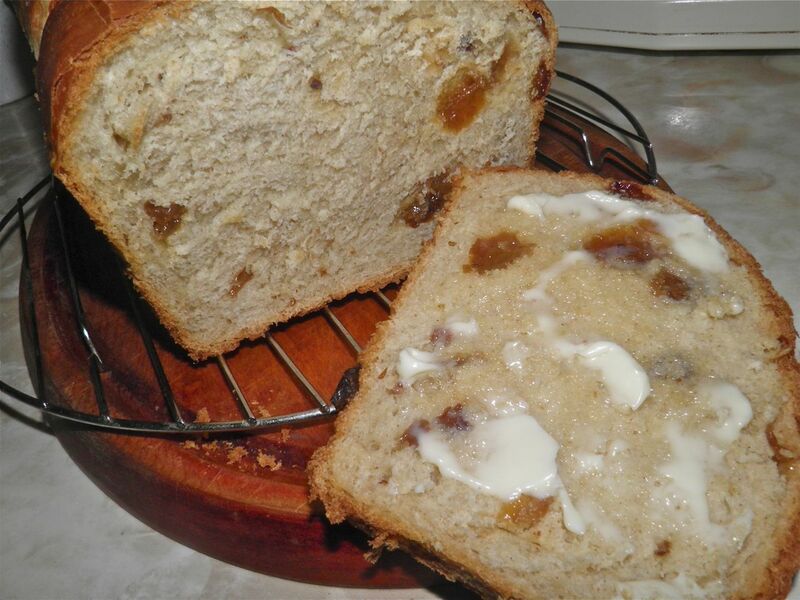 Speaking of memories, this raisin bread will bring a flood of memories of times gone by. There’s actually very little baking I can think of that’s so memorable as raisin bread in the oven. 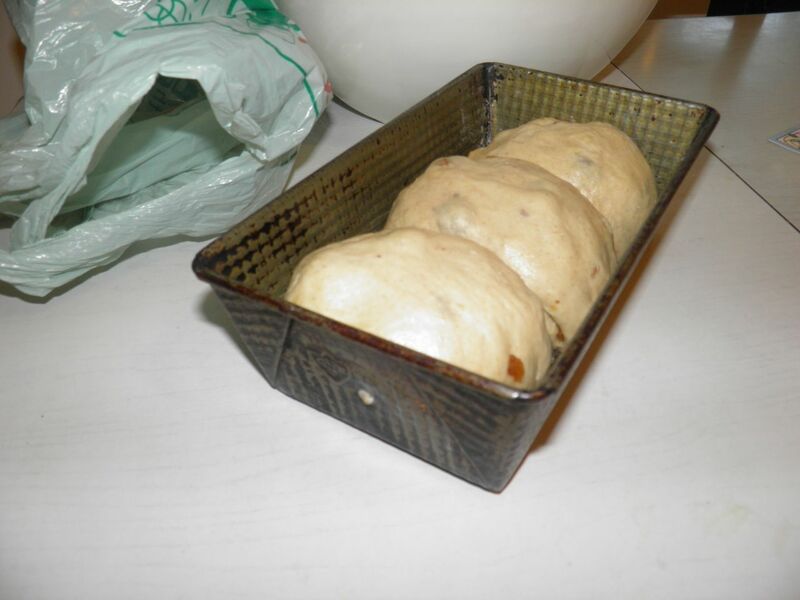 Home, comfort, safety, love – all contained in some yeast, flour, cinnamon and raisins. And an old pan with a hole in its end. The dough after rising overnight in a cool spot. You can also rise for 2 hours in a warm spot. Mix the sugar, milk and margarine together in a small sauce pan. Over medium heat – and with a thermometer in the mixture – heat the milk to 110°F. This is “baby bottle” temperature, slightly warmer than the body. You can also use an “impeccably clean finger” to test if you don’t have a thermometer. That’s how it used to be done. Too hot a liquid will kill the yeast. Add the yeast and let sit for 10-15 minutes, until it becomes creamy. After the second rise – ready for the oven! 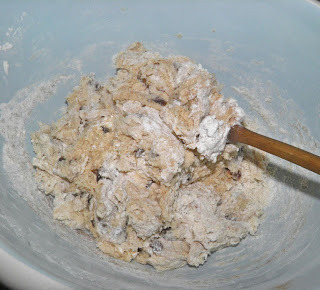 Beat the eggs and stir into the yeast mixture and then the raisins. If the raisins you are using are large, chop them slightly. Then stir in the salt and cinnamon. Finally add the flour. Start with 3-3/4 cup and mix in. Once mixed, remove the fough to a kneading surface. Start to knead the dough, adding just enough to make a very slightly sticky dough. As you knead the dough will become less sticky, but it has to be sticky enough to hold in the raisins. The dough may take the additional 1/4 cup of flour, or not, or maybe even a little more. It depends on the weather the day you make bread, which determines how much moisture is held in the flour itself. 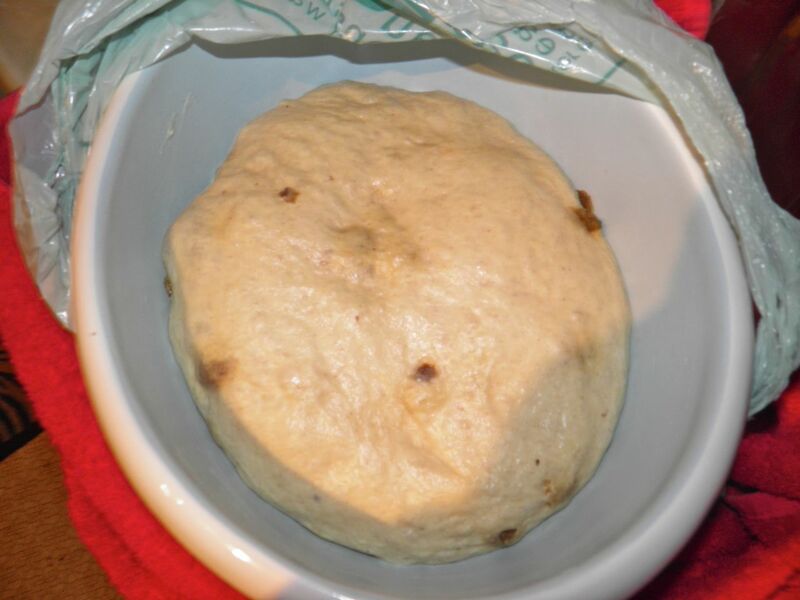 Place the dough in a greased bowl, grease the top and let rise until doubled. Cover the bowl with plastic and then a towel. (I made my dough in the evening and then let it rise in a cool place overnight (12 hours). If you rise in a warm place it should take 2 hours. Once risen, punch the dough down and knead briefly, about 20 seconds. Divide the dough into two or three equal pieces. Make each piece into a round ball. Let the bread ise until doubled again, about another hour. Preheat the oven to 375°F. 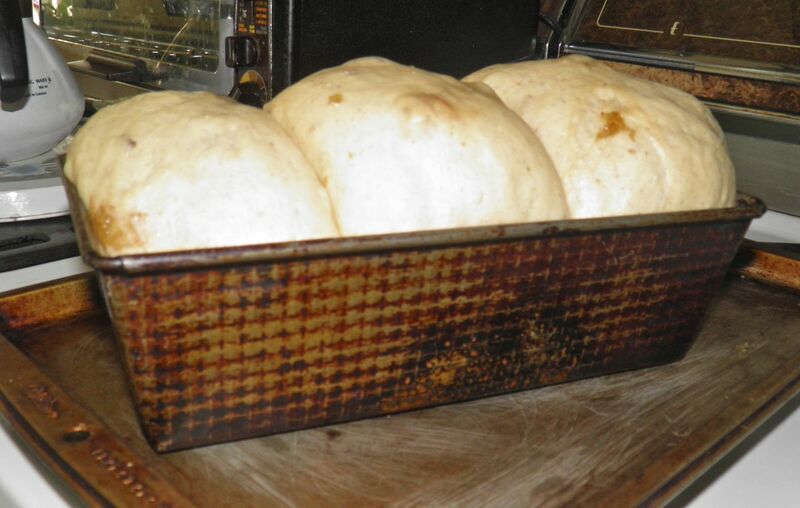 Once the bread has risen, bake for 30-40 minutes. Remove from the oven and rub with margarine and then cover with a towel for a softer crust, or leave as-is for slightly crunchier.